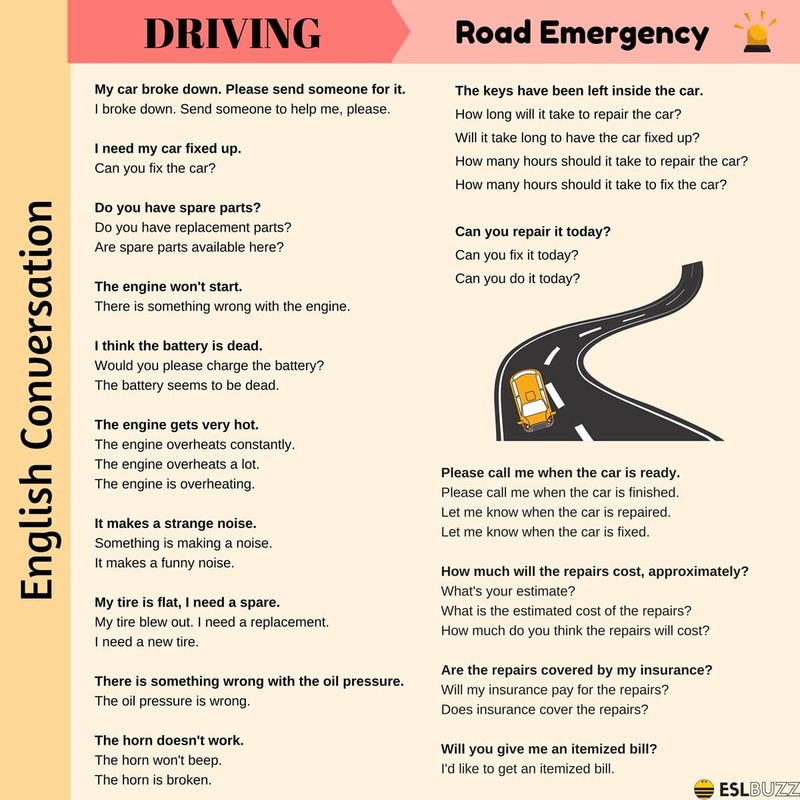 Below is the list of common phrases to talk about DRIVING in English that you should learn. I’d like to rent a car. Can I rent a car here? What is the rental per day? What does it cost per day? How much is the rental per day? How much is the rate per day? May I see your pricelist? May I see the pricelist? How much does it cost for additional kilometers or miles? What is the charge for additional kilometers or miles? How long is the minimum rental period? What is the shortest period of time I can rent a car for? 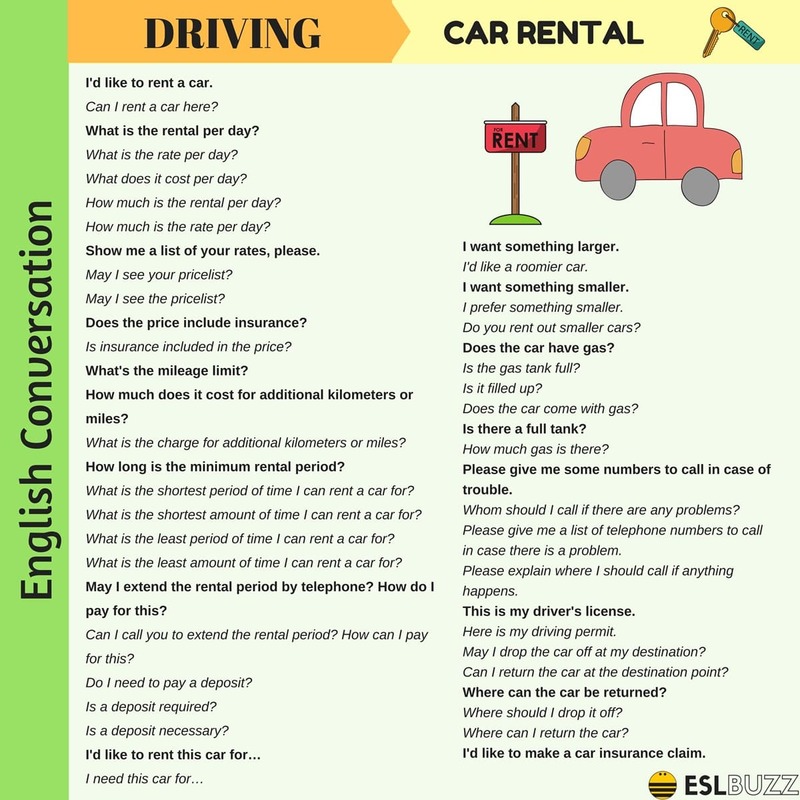 What is the shortest amount of time I can rent a car for? What is the least period of time I can rent a car for? What is the least amount of time I can rent a car for? May I extend the rental period by telephone? How do I pay for this? Can I call you to extend the rental period? How can I pay for this? I’d like a roomier car. Do you rent out smaller cars? I prefer a cheaper car. Isn’t there a less expensive car? I’d like a cheaper car. Do you offer anything cheaper? Does the car have gas? Is the gas tank full? Does the car come with gas? Is there a full tank? How much gas is there? Please give me some numbers to call in case of trouble. Whom should I call if there are any problems? Please give me a list of telephone numbers to call in case there is a problem. Please explain where I should call if anything happens. This is my driver’s license. Here is my driving permit. May I drop the car off at my destination? 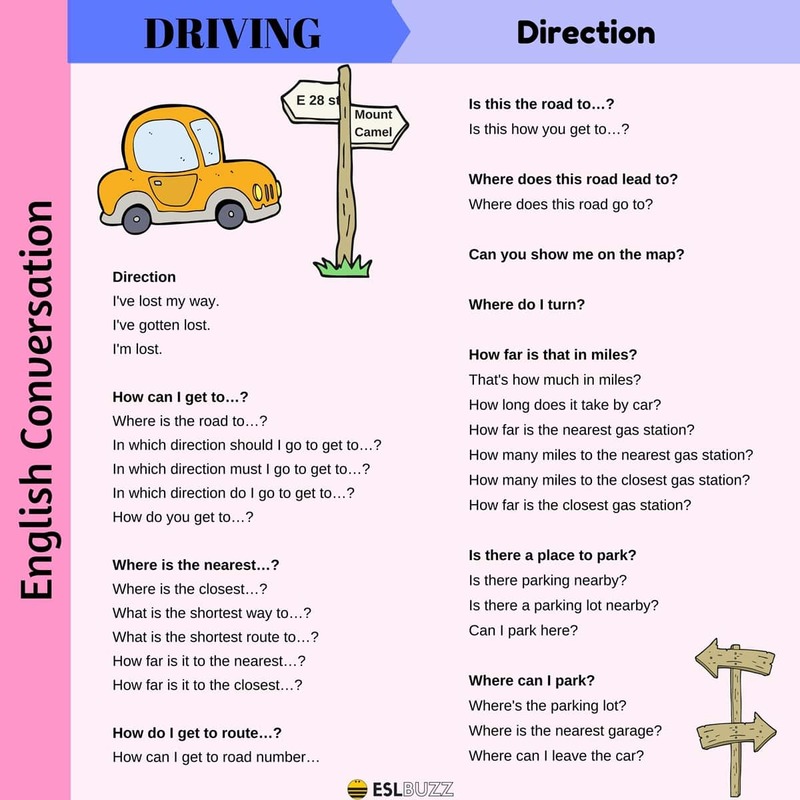 Can I return the car at the destination point? Where can the car be returned? Where should I drop it off? Where can I return the car? I’d like to make a car insurance claim. Where is the road to…? In which direction should I go to get to…? In which direction must I go to get to…? In which direction do I go to get to…? How do you get to…? What is the shortest way to…? What is the shortest route to…? How far is it to the nearest…? How far is it to the closest…? How do I get to route…? Is this the road to…? Is this how you get to…? Where does this road go to? How far is that in miles? That’s how much in miles? How many miles to the nearest gas station? How many miles to the closest gas station? How far is the closest gas station? 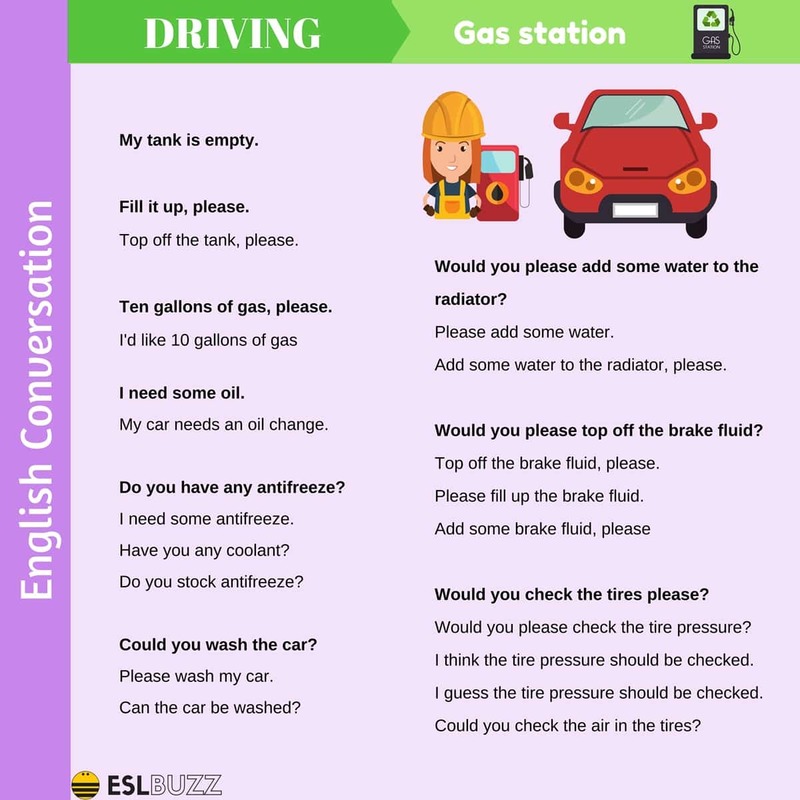 Where can I leave the car? Top off the tank, please. Ten gallons of gas, please. My car needs an oil change. Do you have any antifreeze? Could you wash the car? Can the car be washed? Would you please add some water to the radiator? Add some water to the radiator, please. Would you please top off the brake fluid? Top off the brake fluid, please. Please fill up the brake fluid. Would you check the tires please? Would you please check the tire pressure? I think the tire pressure should be checked. I guess the tire pressure should be checked. Could you check the air in the tires? My car broke down. Please send someone for it. I broke down. Send someone to help me, please. I need my car fixed up. Can you fix the car? Do you have spare parts? Are spare parts available here? There is something wrong with the engine. I think the battery is dead. Would you please charge the battery? The battery seems to be dead. The engine gets very hot. The engine overheats a lot. It makes a strange noise. Something is making a noise. My tire is flat, I need a spare. My tire blew out. I need a replacement. I need a new tire. There is something wrong with the oil pressure. The oil pressure is wrong. The keys have been left inside the car. How long will it take to repair the car? Will it take long to have the car fixed up? How many hours should it take to repair the car? How many hours should it take to fix the car? Can you repair it today? Can you fix it today? Please call me when the car is ready. Please call me when the car is finished. Let me know when the car is repaired. Let me know when the car is fixed. How much will the repairs cost, approximately? What is the estimated cost of the repairs? How much do you think the repairs will cost? Are the repairs covered by my insurance? Will my insurance pay for the repairs? Does insurance cover the repairs? Will you give me an itemized bill? I’d like to get an itemized bill.